Many steps, but really not so difficult to do. We'll start, as with every Three.js project, with the basics, and add the Three.js initialization code. The following code is the basic code you need to get started. In this small piece of code we create a Three.js scene, a camera and append it to a specific element in the html page. I use JQuery to determine when the document is ready. Once the HTML page is completely loaded I read in the data to plot and add the various elements of this graphic. 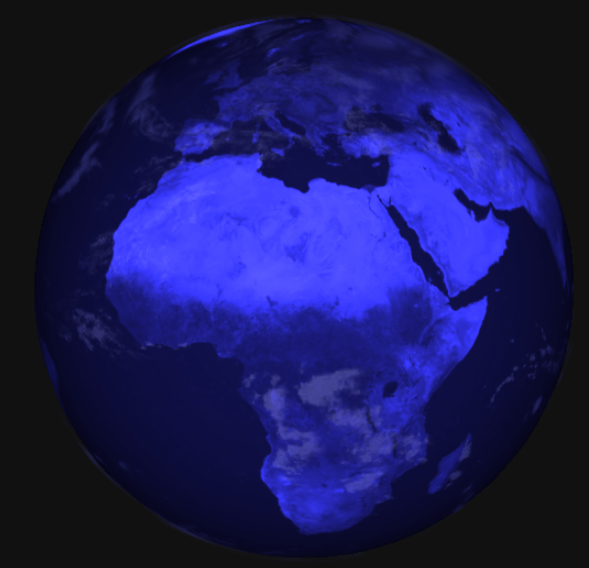 We start of easy, by creating the 3D globe of the earth (the addEarth and addCloud functions). We start of with a very basic earth. This earth is rendered as perfect sphere (which the earth in reality isn't), where we add a texture that is a satellite map of the earth. I converted the map to grey scale to make it less prominent in the finalized scene. Good starting material for maps of the earth can be found from nasa here: http://visibleearth.nasa.gov/view_cat.php?categoryID=1484 .The basic earth map doesn't contain clouds, we can easily add them by creating a somwhat bigger sphere with a cloud texture. I've used the clouds texture from the Three.js examples, but you can also find different other textures online. Now all we need to do is add some lights and we've got our basic globe setup. This adds a basic directional light (at the same position as our camera). I've used a blue-ish color here. If we render this scene we get the following: an earth rendered with a blue glow. 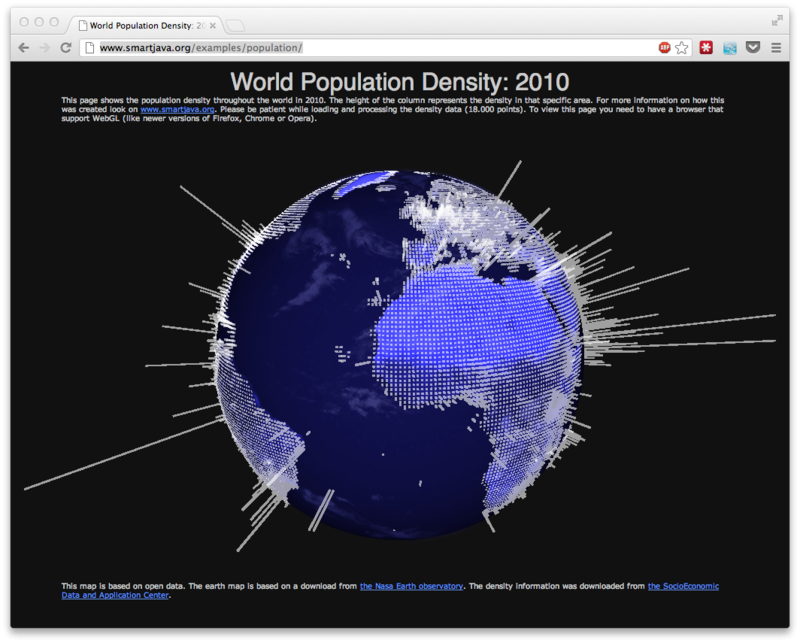 So we got 143 rows and 360 columns representing data for the complete earth. In my first try I converted this to json data, but the resulting file was 1.5MB and took some time to parse. So in the next try I just stripped the header, and saved it as a simple cvs file, where each line is an x,y coordinate. At this point we've got a set of x,y coordinates (in WGS84 style) that we can use to plot this information on a 2D map (as is done on the SEDAC) site. We need to convert this x,y to a point on our sphere. // convert the positions from a lat, lon to a position on a sphere. This function converts a x,y coordinate to a point in a 3D space. The radius supplied here is the radius of our earth, and the height is used as an offset of how high above the surface we want to start drawing. // the height of each marker is relative to the density. // add colors relative to the density. Not done here. // create a new mesh, containing all the other meshes. We first convert the x,y from the input format to the -90,90 - 180,-180 range. Using the function we described earlier, we convert the x,y to a position on the sphere. These values are then used to create a cube. You can see that we use the value as the height op the sphere. To make the object 'look' at a specific point in space. If we make the object look at the center of the Sphere it will be aligned correctly. We made one optimization before adding the cubes to the scene. The important method here is the merge method. What this method does is it copies all the faces and vertices from the cube we created to the geometry we created in the beginning of this function. The reason we do this, is that we now only have to add a single object to the scene, instead of 18000. This will massively increase rendering speed. We also reuse the material, which is another big rendering optimization. However, this is still a fairly heavy 3D object, so rendering, especially on slower hardware can take some time. On the other hand, I was able to view this on my 2 year old smartphone. The final step we add is a simple rotating animation. This time I rotate the camera and the light. And that's it. The complete example can be found here.